Washington D.C. - "Wow in the World," a podcast for kids and their parents, is thrilled to announce the production of 40 new weekly episodes starting November 6th. The show, which is produced by Tinkercast and distributed by NPR, is now leading the field in the previously untapped market of children's audio. Since the podcast launched in May of 2017, it has topped the kids and family podcast charts reaching over 5 million downloads and averaging around 200,000-300,000 downloads per week-- clearly showing families are hungry for screen alternative content. "Kids and parents are looking for an alternative to screens—a fun, exciting, silly (and educational) way to spend time in the car, at the breakfast table or even hanging out at home. That's what "Wow in the World" is! We think of it as a cartoon for the ear but a cartoon that takes kids and grown-ups deep into some of the most amazing scientific discoveries of our time. Mindy and I pore through peer-reviewed academic journals to figure out how to translate the amazing work of scientists into a kid-friendly adventure through space and time." In this season we'll find out how horse's got their hooves and why onions make us cry, we'll visit the Solomon Islands and meet a giant rat who lives in the treetops, attend a 'coral' concert in Australia's Great Barrier Reef, and take an adventure through the human body! These new episodes bring more big discoveries, more cheesy jokes, and more crazy new inventions. Plus we'll continue to share the amazing messages that we receive every single day from kids all over the planet, sharing the big WOW's in their worlds! Through comedy and conversation, hosts Guy Raz and Mindy Thomas guide curious kids and their grown-ups away from their screens, inside their brains, out into space, and deep into the coolest new stories in science and technology. By sharing positive and inspiring news stories, Wow in the World provides a vehicle for families to share in the wonders of the world together and offers an alternative to kids' growing screen time. According to Common Sense Media, nearly all children under age 8 live in a home with a mobile device and spend an average of 48 minutes (out of 2.25 hours) of daily media use on mobile devices. That is three times the amount of time spent on mobile since 2013. With more than 200k downloads per episode, the popularity of "Wow in the World" shows that compelling audio content can entertain, educate and engage kids in the real world while offering an alternative to screen time. James Kee, a 7-year-old from San Francisco, has found something even better than TV. Since the NPR podcast for kids "Wow in the World" debuted in May, he's listened to every episode three times. "It's a little funner" than television, James said. "My brain works better." "The world may appear to be filled with violence and hatred, but it's also filled with wonder and excitement — just ask Guy Raz and Mindy Thomas." Podcast-loving parents should tune in for the familiar voice of Guy Raz, host of the popular TED Radio Hour and How I Built This. And they should keep listening to hear children laugh at the goofy Mindy Thomas, host of SiriusXM's Absolutely Mindy.Grown-ups might even learn a thing or two about the world. This half-hour dose of science and technology has endless energy and a whole lot of fact-based fun. Share your feedback with "Wow in the World" – send your thoughts, photos audio or video. Follow the contact form here: https://tinkercast.com/wow-in-the-world/share/ or call 888-7WOW-WOW. Tinkercast is the leading producer of high-quality educational audio programs for curious kids and their grown-ups. Founded in 2017, Tinkercast provides a creative alternative to screen time with its unique combination of comedy and conversation that engages the minds of the whole family. Through the wit and wisdom of Tinkercast founders Guy Raz and Mindy Thomas, "Wow in the World," the company's premiere podcast, leads curious kids on a creative, auditory journey into the most amazing stories in science, technology and new discoveries. 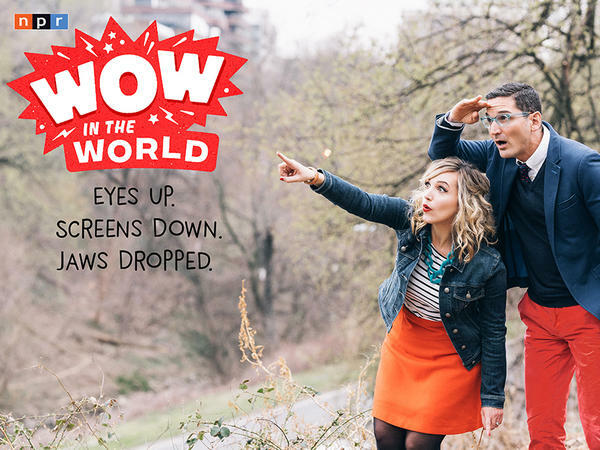 Distributed by NPR, "Wow in the World" is NPR's first kids and family program in its 47-year history. In its first season, the show led the quickly growing list of kids podcasts with more than 5 million downloads in 5 months, and 250,000 downloads an episode. The show has been recognized by publications such as The New York Times, The Washington Post, and The Today Show for creating new ways for families to connect, look up, and discover the wonders in the world. "Wow in the World" is available on Apple Podcasts, NPRone and other podcast streaming platforms. Connect with us at www.tinkercast.com, Facebook, Twitter, Instagram or Pinterest.